I had a fun time at the Island Arts Association Holiday Fair. Fewer people came through on Friday, but it picked up a lot on Saturday. I was fortunate to have had some good sales and, as always, to have seen so many good friends before the holidays. The boat schedule from Islesford did not enable me to go back home, so I spent the nights off island at the home of my friends Harriet and Jim in Somesville. We had some good laughs as we usually do. 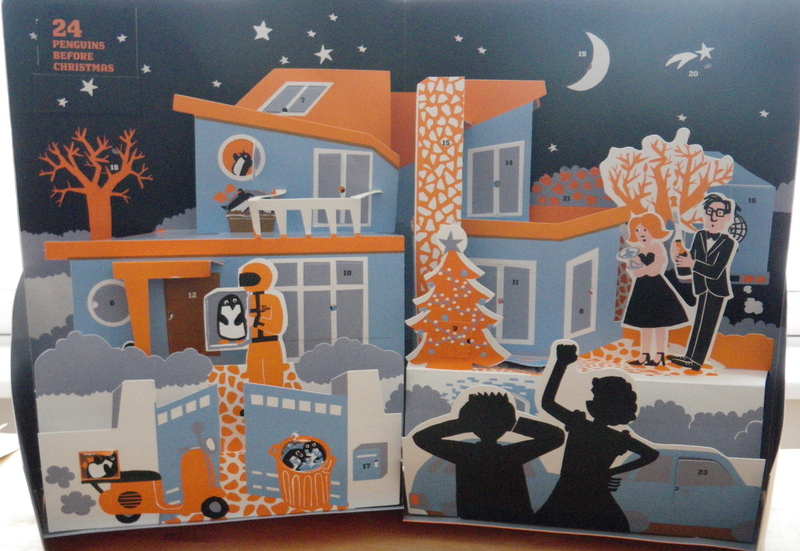 Especially about this wacky penguin advent calendar. On the night I arrived, I thought Jim and Harriet had forgotten to put away their Halloween decorations! It turns out that the calendar was printed in Malaysia, where maybe our word for “red” is their word for “orange.” And maybe green means blue. 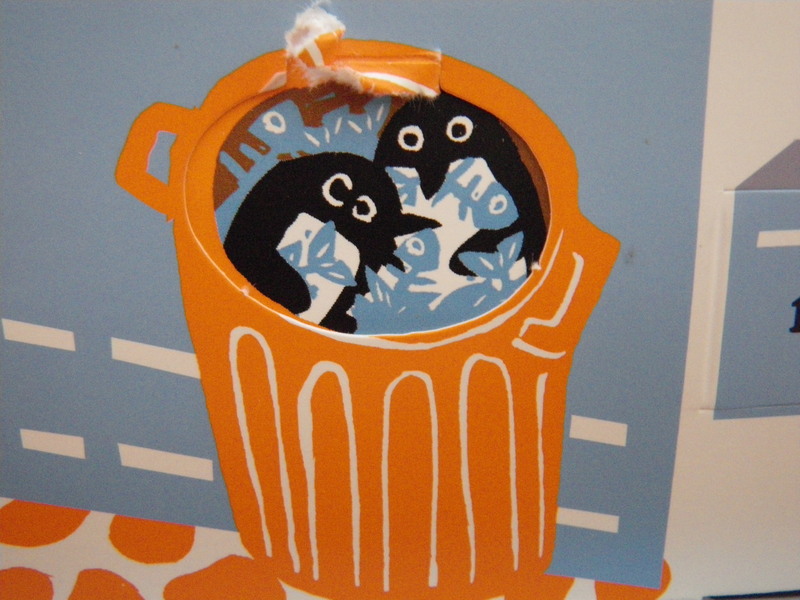 On second glance, what’s not to like about penguins chowing down on fish bones in a garbage can. Now that is some serious holiday fun! On night #2, after a long day of work for all of us, we found we still had some energy to go back into Bar Harbor for the Midnight Madness sale. We found some good deals while supporting local businesses. On night #3, I was finished with the fair, my car was packed up and I was looking forward to a quiet night. 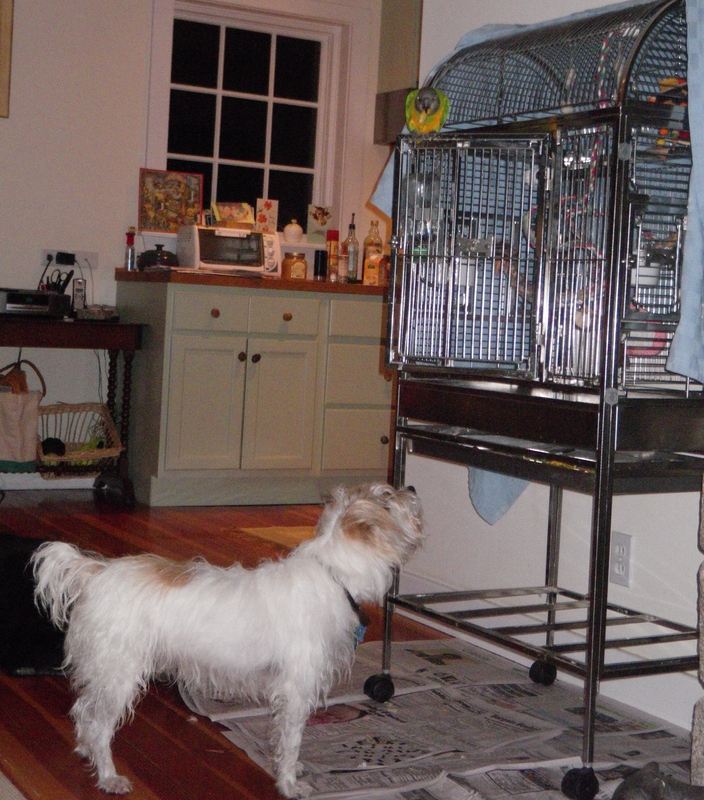 Jim and Harriet had a dinner invitation, so I hung out with their dogs Bailor and Tucker, and their parrot Sam. Sam doesn’t talk, but he sure can imitate sounds. When I put something in the microwave, his beeps matched exactly the beeps of the buttons I pushed. As I unzipped my cash bag to organize my checks, I kept hearing the sound of a zipper from across the room. I opened Sam’s cage, as he likes to sit on the door at night, where he throws food down to Bailor. I tried to teach the bird to make the sound of a dripping faucet…I’ll be waiting to hear from my hosts if I was successful. 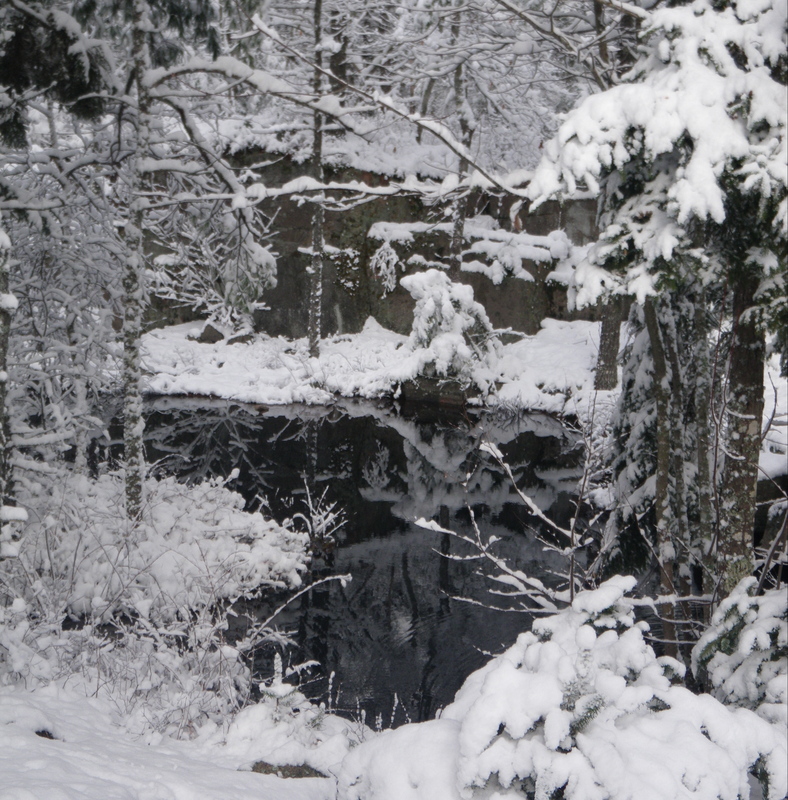 On Sunday morning, we awoke to the first snowfall of the season. By February I’m pretty tired of the stuff, but the first snowfall is a treat. If by any chance, the woman who really really wanted my needle felted snowman is reading this blog entry, I really really did give it to my hosts as a thank you gift for letting me stay. But if you absolutely have to have one, I could manage to make another one. What I should have told you, but was too distracted to remember at the time, was that there are some really great needle felted snowmen on Etsy. Just got to etsy.com and type in needle felted snowmen in the search area. Or copy and paste this address in your browser. I think you will like it. Barbara what a great blog and such a beautiful photo! Hi Donna, Thanks. I wish I had taken the extra 5 minutes to get the scene at the end of Somes Sound as I was rushing to get some shopping done in Ellsworth. The clouds, snow and water were incredible. This one was the little quarry that’s right outside of the house where I stayed for the weekend. Happy winter! Looks like fun! That Advent calendar is based on the childrens book 365 Penguins. Great illustrations! Aha! You are up on your children’s books of course! I’ll check this out. We can’t wait to see you and Fritz tomorrow! And you parents on Wednesday! This is my one day home to unpack and repack. Phew! Great pictures and hilarious about the bird and dogs!! Chris just saw Bruce in NEH and handed off a bag of goodies to him! Have a great safe trip. Thanks Susan! Of course, you will get a package at the last minute b/c I haven’t even started to think about Christmas yet!! Once I’m back from Boston, I’ll jump right into holiday mode. I thought you would like the animal story!